Het Anker | Beer Apprentice - Craft Beer News, Reviews, Interviews and Info. Hi guys. For today’s craft beer review I’m going to be trying the Gouden Carolus Cuvée Van De Keizer Blauw (2012) produced by the Brouwerij Het Anker situated in Mechelen, Belgium. I’ll be honest, I’ve never even heard of this beer before, so I don’t really know what to expect. All I know is that it was highly recommend to me the last time I went to my bottle shop. Therefore, I grabbed one. Let’s get over to the website, www.hetanker.be, and find out what it’s all about. Every year on the 24th of February, we celebrate the birth of Charles Quint. Therefore we brew a special beer in limited edition called Cuvée of the Emperor. This exceptional beer is a special version of the Golden Carolus Classic, with an enriched taste pallet and mysterious aromas added. The caramelised malts and its 11% Alc. Vol. give the Cuvée of the Emperor the warm roundness of wine together with the refreshing taste of beer. It is imperially crowned with a special cork so it can be preserved for a long period of time with a constant cellar temperature of 12° C. An imperial beer to cherish and enjoy in moderation. Well, it sounds pretty special, so let’s get it cracked. This beverage came in a 25.4 oz. bottle and it had an ABV of 11.0%. It poured a deep, dark burgundy color with some ruby highlights showing around the edges and the bottom of the chalice. An easy pour produced a light tan head that was not overly large. The texture was smooth and slightly creamy and it had a pretty good retention time. The lacing was sticky, clingy and consistent. A nice looking beer in my opinion. The aroma was filled with dark fruits. Plums, raisin and dates mostly. A strong component of Belgian yeast and fresh dark breads began to appear as the brew warmed a touch. Further into the bouquet a very delightful candied sugar waft merged with some caramel malt and spicy clove to create a very intimate, well balanced and proper smelling Belgian Strong Ale. Beautiful. The taste was more of the same. Dark fruits amalgamated with that Belgian yeast and bread. Sugary sweet caramel malt and clove tied everything together while the slightest shot of alcohol brought up the rear. Again, very well balanced and harmonized all the way through. The mouthfeel was medium bodied. Smooth, chewy, dry and slick. The carbonation was on the medium to low side. A good shot of warmth was felt from the booze and a ton of flavor was left behind drenching the palate long after the sip had gone down. Yeah, this is a great beer. I, no doubt, will pick this up again sometime in the future. It’s a “top tier” brew that is complex, flavorful and bold. Even though the drinkability is pretty good I’d still advise that you take your time and sip because that 11.0% ABV will get on top of you in a hurry. I’d love to cellar one of these for a few years and find out how it might develop. 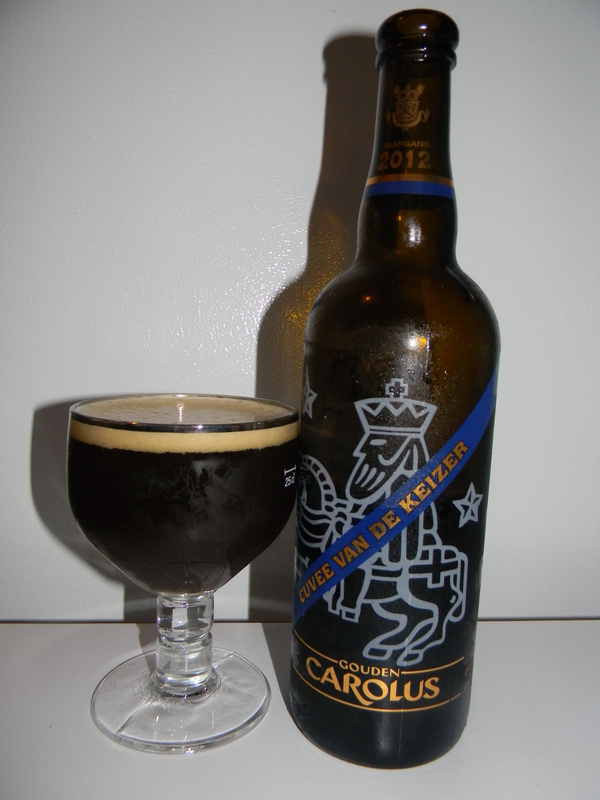 Definitely give the Gouden Carolus Cuvée Van De Keizer Blauw a try if you can obtain a bottle If you can appreciate the style I’m sure that you will find this one to be exceptional. As always, be sure to leave a comment and tell me about your experience.